This post Investment Secrets from the 2018 Monaco Grand Prix appeared first on Daily Reckoning. The whole experience was pretty much sensory overload? For a car nut like me. The screaming engines? the screeching tires? famous names like Ferrari, McLaren, and Lotus whizzing by at breakneck speeds. There's also the glamorous setting ? replete with ultra-wealthy fans watching from their yachts, sipping champagne on private balconies overlooking the streets, and pulling up in their own exotic cars. The 2018 Monaco Grand Prix ? one of the most prestigious auto races in the world ? was held this past weekend on the streets of Monte Carlo. 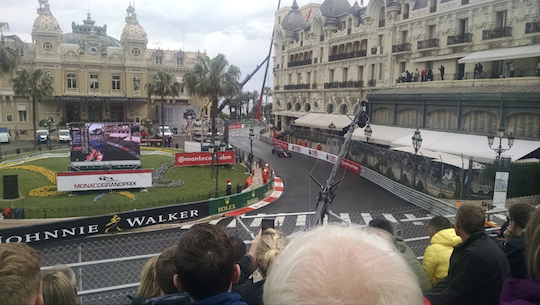 Three years ago, I had the good fortune of watching this world-famous race with my wife and daughter in person, from a prime seating area right in front of the Monte Carlo casino. From my seat at the 2015 race. Of course, given the extreme limits of modern-day F1 cars, most knowledgeable folks say the only reason this race is still held here is because of its deep history and global cachet. Remember, unlike most other major automobile races, the Monaco GP is essentially being held on the public streets of a very old town! This kind of an event feeds into the idea that race car drivers are either reckless, stupid, or both. The truth, however, is much different. Indeed, I've also attended a high-performance driving school where I learned the ropes driving an open-wheeled formula race car. One of the first things I learned was that the fastest drivers typically look slow. They don't move their hands all that much. Nor do they swerve their cars all over the track. They may seem downright bored behind the wheel? Even when they're travelling 200 miles an hour! It's the same thing with some of the world's most successful investors and investment approaches. He's not changing his strategy every single day or thinking about what other investors are doing. Rather, he continually looks beyond the apex of the turn for an exit point much farther down the track. That idea of seeing where you want to go, rather than worrying about where you are, is crucial? but it takes a lot of practice when you're used to looking five feet in front of your face. In my class, we were encouraged to start out slow and build technique rather than trying to go flat out right away. As our instructor explained, the speed would come naturally over time. That's very similar to the approach I recommend in my Rich Life Letter. All you have to do is pick the right line, run it consistently, and you'll end up crossing the finish with time to spare ? whether you're talking about the Monaco Grand Prix or the endurance race called retirement planning. Obviously, there will also be slides along the way? so how you handle them is equally critical! Whether it was caused by a puddle, a patch of ice, or a sudden jerk of the wheel, it's almost certain that you've experienced the uneasy feeling of having your car's rear end slide out. But against all common sense, the absolute worst thing you can do when you slide out is slam on the brakes. In fact, sometimes you should even step on the gas! The first time I drove the open-wheeled race car, I missed a gear change coming into a sharp left-hand turn. And as I felt the back of the car start to slide, I instinctively pushed in the clutch and braked. As you can imagine, the whole car spun off the track in a cloud of smoke and dust. Fortunately, I later had the opportunity to practice driving special cars that automatically start sliding the wrong way whenever you turn them. At first, I kept making that same instinctive mistake of braking. But over time I got very comfortable letting the car drift one way and then the next as I blipped the throttle and kept my eyes focused on where I wanted the car to go. Amazingly, my hands did all the correcting without any input from my conscious mind! And even more amazingly, the next two times I found myself sliding out in an actual race car, I quickly corrected my mistake and continued zipping along down the track! The point here is that it takes practice, commitment, and confidence to ride out those shaky moments ? in a car or your investment portfolio. As with anything, you simply have to know when to stay the course or when it's better to look for a safe exit. So in the end, I think investors can learn a lot from racecar drivers ? whether they like fast cars or not. The post Investment Secrets from the 2018 Monaco Grand Prix appeared first on Daily Reckoning.